In 1913, the Department of Chemistry celebrated its first three graduates: Charles Neil Cameron, Ashley Mackintosh Walker, and Osman James Walker. The oldest of these was Ashley Walker, who was born in Ancaster, Ontario. He was 25 when the establishment of the U of S provided him with his opportunity to pursue higher learning in 1909. While at the U of S, he was a scholarship winner and a rugby champion. Ashley graduated into a time of global upheaval, and like many young men of Saskatchewan, he enlisted in the war effort, and served in the 196th battalion and the Canadian Army Medical Corps; in fact, he served in the same battalion as John Diefenbaker. Ashley was wounded in the war, but survived and returned to take up a teaching position in Regina. His wife, Helena, was active in the Regina community, and in 1932 became the first woman to be elected to Regina City Council. Charles Cameron was the youngest of the three, not yet 20 when he graduated. He had come to Canada from his native Scotland in 1903 to settle in Saskatoon. He too was a scholarship student, and like Ashley he enlisted in the army during World War I. He served in the Princess Patricia's Canadian Light Infantry, and was lucky enough to survive the trenches of France, though he too was wounded. When he returned, he pursued a Master's degree in Chemistry in this same department, before going on to a PhD at the University of Chicago with Professor John W. E. Glattefield, a pioneer in the reactions of sugars. Dr. Cameron returned to Saskatoon, where he became a professor in this department in 1923. At that time, he met Margaret Shiel, a recent Masters graduate of the department who had become an instructor. Charles and Margaret married, and had two daughters. Sadly, Professor Cameron's life was cut short by pneumonia in 1929. Osman Walker was born in Portage La Prairie, and like Charles he was destined for a career in science. He worked as a chemist in Saskatoon after graduating, then pursued graduate degrees at Harvard and McGill University. While at Harvard, he worked with Professor Theodore W. Richards, who had served as mentor to Osman's professors at the U of S, Dr. R. D. McLauren and Dr. L.L. Burgess, as well as to a future faculty member named Thorbergur Thorvaldson. (Dr. Richards, who was awarded the 1914 Nobel Prize in Chemistry, served as an inadvertent father to this department!) Osman joined the faculty of the University of Alberta, where he was professor of chemistry, including 16 years as the head of that department. While at McGill, he had married Ella May Jacoby, and they raised two sons. Ella May Walker became a renowned Edmonton artist, musician, and author, as well as an advocate for the preservation and documenting of Edmonton's history. 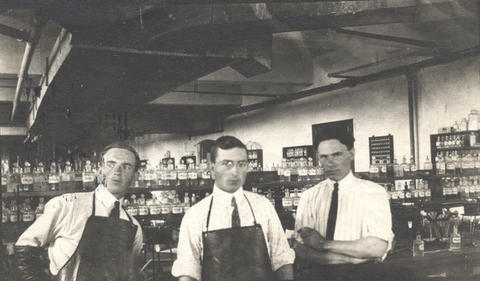 This photograph, taken in the original chemistry laboratory in the College building (now the Peter MacKinnon Building), is believed to be (from left to right) Charles Cameron, Osman Walker, and Ashley Walker. This history was collected by Dr. David Palmer, with greatly appreciated help from Tim Hutchinson and the U of S Archives. If you have information you would like to share about these or any other Chemistry graduates, please contact the department.